Size 5'4" x 7'8"7'8" x 10'9"10'9" x 13'2"
Let's play a game called Alphabet Phonics! 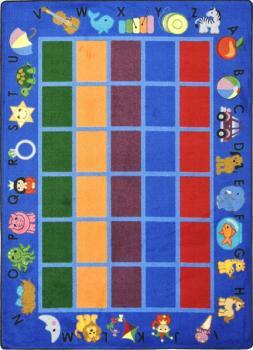 Your students will love learning about the alphabet, while sitting on the most comfortable classroom rug on the market. 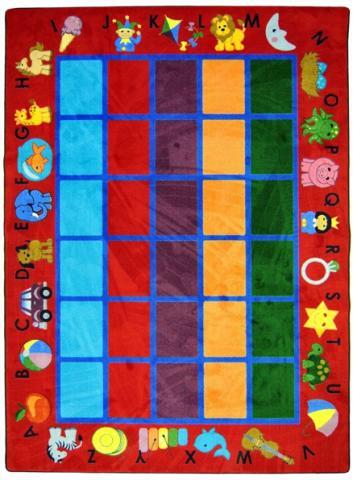 We have designed solid color spaces in the center of the Preschool Classroom Rugs, surrounded by each letter of the alphabet along the rug's border. You can play a game where you pronounce a word and your students compete to see who can find the first letter of that word before anyone else. 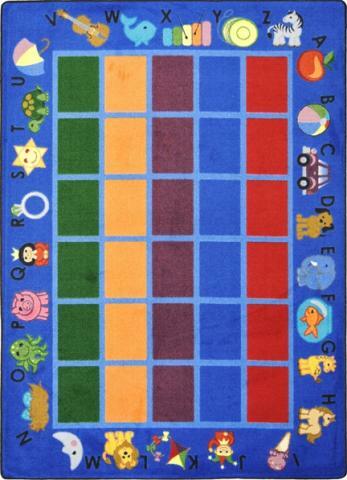 While our interactive feature has become popular with teachers, school administrators will love the durability of the Preschool Classroom Rugs. Our innovative SoftFlex® fabric withstands the most demanding classroom environment. We feel so confident in the construction of the Preschool Classroom Rugs that we provide a lifetime limited wear warranty. We also protect your children against mold and mildew by administering an antimicrobial treatment. We use fade resistant materials that your students can enjoy for years to come.